I have a couple of simple beliefs on wallets and chief among them is coins. There's no place for coins in mens wallets. Disagree if you like, but you'll find no quarter for them here (to re coin a phrase). Coins shorten the life of your leather goods and make the piece so thick it will ruin the cut of your trousers. move on. Most commercial wallets use very thin chrome tanned garment leather. 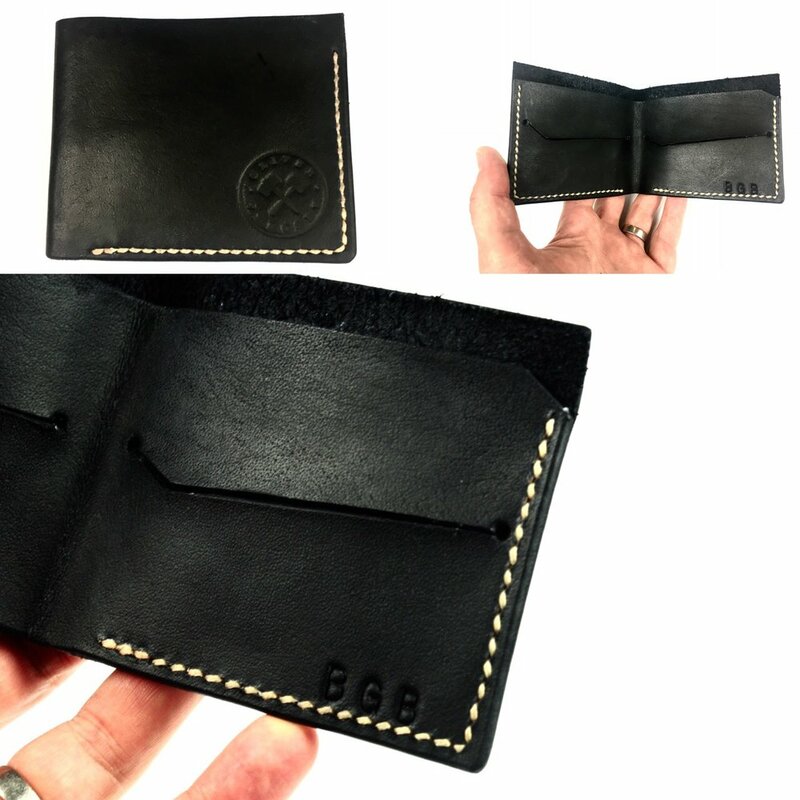 This is to keep the wallet thin while using several layers of leather to separate cards etc. A note on tanning - we can separate tanning into two camps, 1. Chrome tanned, 2. Vegetable tanned. Chrome tanning is most all of the leather you see day to day. not so great for the environment as it put various minerals and chromium into local waterways. Vegetable tanning uses Wattle or Oak tree bark and several salts to convert the leather from skin to a leather hide. Think saddles and horses. It's very tough and ages beautifully but the thinnest veg tanned leather gets is about 1mm - too thick for several layers of wallet. The top three images are all made with veg tanned hides. The lighter of the two is dyed with reduced coffee and vermouth. It retains the lovely aroma of coffee months into using it. I tend to prefer veg tanned leather for small pieces like wallets and the design is such that cards sit together and space is made available for notes behind them. Aussie dollars are fortunately among the smallest currencies. A wallet in the U.S will need to be longer and the British will need a taller version to accommodate their heavy Pound Stirling. The trick to a long last lasting veg tanned wallet is hand stitching. It's not a quick process, but a machine will struggle to produce such sturdy results. Each hole must be punched with an awl or stitching chisel and then two needles are used simultaneously to 'saddle stitch' the edges together. Finally a line of stitching doubles back on it's self three stitches to keep it secure. All my wallets will age beautifully. Some scuff up nicely and others will develop an aged shiny patina unique to you.